How life changes, a few months ago I was scrabbling around for opportunities! Have you ever noticed how when you chase things they run off in the opposite direction? Well recently things changed and one of the worlds best-known hypnotherapists actually asked me if I wanted to be interviewed for his PodCast. When I saw that he had interviewed so many people I really admire, well what could I say except a YES please. What an opportunity to join a line up including; Igor Ledochowski, Chris Thompson, Karl Smith and Mike Mandel. So here is the link to the site, just click the Image! Ever been asked what you want for your Birthday? There are two ways of answering, a direct approach - "Oh I would love that someone bought me a......" or you just drop hints, hoping they can afford and will buy you whatever it is. You will have realised by now that if you really want something - you have to state very clearly what it is, including the details so they buy you the right thing. Hints don't work well either for you or the person buying the present. They want to get something you will love and are concerned they will get it wrong, so may fall back on a safe option, or just simply get it wrong whilst thinking they are getting it right. The present moment is the only moment we have. That is why it is called the present. We get to choose what to fill our present with - this is called free will. If we don't enjoy the present it is often that we aren't living in it. We all spend a lot of time in the future or in the past in our thoughts. We go over regrets or injustices as though we can somehow change it by thinking about it yet again. Or we project ourselves into the future, often into the worry of predicting a bad outcome for something that is yet to happen. The thing few people know but should is that the unconscious gets confused by negatives. When we think about what we don't want that is exactly what it delivers to us. We have a conscious mind for free will and the unconscious to carry out what we have asked for by running any one of millions of programs available to it. This is why we don't have to think about walking, only where we want to get to. When you want someone to buy you a car for your birthday, you can't just answer "don't buy me a pen", when they ask what you want. A pen may be the only thing that sticks in their memory and therefore that is what you get. Your unconscious struggles each day to make sense of what it thinks you are asking for. According to Eckhart Tolle 70% of our thoughts are negative. That is one hell of a lot of confusion for the unconscious trying to decipher what you want! The answer is simple. For a life you can love, be clear what you ask for in your thoughts, including the details that are needed. The unconscious can then do its best to provide you with it. Enjoy your present! 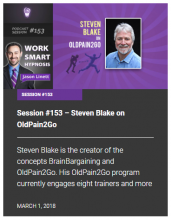 Steven explains OldPain2Go® to Ian Timothy of Lizian Events. 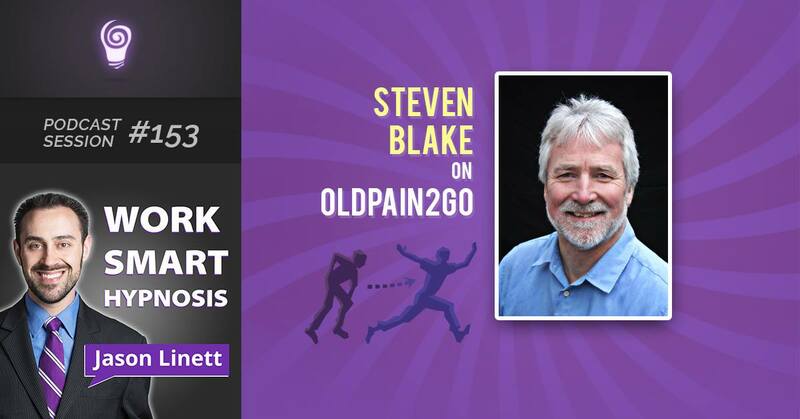 Steven Blake OldPain2Go® from LizianEvents Ltd on Vimeo. Imagine you live in a house where the smoke alarm triggered 10 years ago for a fire that was put out that night. However, the alarm has continued to ring incredibly loudly 24 hours a day 7 days a week ever since. You cannot throw the alarm away or take the batteries out because that would put you at the risk of serious injury or death, and so would muffling the sound with a pillow. So you can’t live with this alarm, but you also cannot live without it! Have you ever thought that whilst it keeps ringing loudly, it will not alert you if a new fire has started in the vicinity? Or that eventually it will need to ring evermore louder so that you are still aware of it and alert? So imagine now that someone invents a reset button. It is simple to operate all you do is press it once and it tells the alarm that the fire it warned us about is out, and it can now look out for new fires. The first fire may have caused irreparable damage but that is not the concern of the smoke alarm, it is programmed so that the smell of charcoal does not falsely trigger it. Its only job is to alert us to present danger only as and when it happens. Old pain is like an alarm, it carries on telling you a message that you acted on a long time ago. If there is no need to remind you then you can safely have it reset. Been in pain for a long time? Would you like to be free of it? It is likely that you can be, in fact the longer you have had the pain the easier it is to remove it – let me explain. New Pain is necessary for survival, it makes you take your hand off a hot stove, or stop using a limb with a broken bone. The Pain is appropriate for the damage, a small cut hurts a bit, but a broken arm will be very painful and make an urgency to get it fixed. Once the damaged area has been attended to and the appropriate action taken the pain goes away! But not always…..
You see pain isn’t what it seems. Pain always appears to be at the very place the damage is, it has to be that way so that we look in the right place. And yet pain is really a message that is created in the head and transmitted to the damaged area, both chemically and electrically. It is created following a lot of messages flowing back and forth in the body, the cells report in about the damage and then all the information gathering goes on including the visuals (does it look bad?) and the memory (what happened last time?). Even how you feel about the incident will affect the pain level, if you feel someone hurt you intentionally the pain is stronger and lasts longer than if they hurt you accidentally and apologised profusely. Pain is really a complex mixture of all the senses focusing on trying to help and repair by focusing on an area that needs the most help. Pain forces us to tense up to protect the area and then inflammation is provided to help heal. Whilst pain stays, so does the inflammation, which then does more damage than good. At some point, the pain should stop! The message has been heard and acted on, suitable medical attention has been had and you now are either told there is nothing they can find wrong with you or that the pain will continue because of the damage done and the best that can be done is pain relief! If that is where you are now, then that is the very pain that can be released from. Why? Because the Pain Message is no longer required – it has done its job. You are aware of the damage so continuing to give you pain is totally redundant and unnecessary. Even with degenerative conditions, the pain is unhelpful because it masks that area with the Old Pain making it difficult to distinguish any further deterioration or new damage. With Arthritis for instance, why do you need the pain to remind you of the difficulties of movement – you don’t, and often it is also visibly reinforced that you have a problem (wrists locked up etc.). Pain killers become less effective over time, in fact, if the body feels it needs pain it will fight the drugs that try to stop the message getting through. So the pain intensifies and spreads and the drugs become ever less effective whilst also causing the other problems associated with drug taking. The brain is the transmitter for these messages and the area where pain appears is the receiver. Drugs are designed not to turn off the message but to give it contradictory messages to block or interfere with the pain message getting through. How stupid is that – when you compare it with just asking the the operator to stop transmitting that old message! So, what is the answer? OldPain2Go® works by bargaining with the unconscious mind, which operates all the body’s systems. Quite simply we ask it, that unless there is a reason to keep the pain, to erase that Old Pain Message. Once we have given the unconscious enough to convince it to remove the Old Pain Message it does so, usually – INSTANTLY (it may be a few minutes before the full effect is felt). We understand who would not be a good candidate for the OldPain2Go® system. Quite frankly that is: anyone who has more reasons to keep the pain than to lose it! We cannot help the people who love to moan that no one can help them! Or those that have had a life being a “Misery Guts” because they just won’t allow the healing. Who we can help: anyone who really would improve their life by being pain free. You don’t have to believe it will work. All you need is to want it to work, most clients are sceptical, before, during and even after several months of being pain free! Because this treatment is way outside most peoples belief system, it does seem like being Pain free is an illusion and yet pain itself is the illusion, all we do is remove that terrible all consuming, life destroying illusion. No trance, no physical manipulation, just a conscious discussion with you that your unconscious listens in on – it really is as simple as that. And by the way, you reading this has meant your unconscious also absorbed it, so I’m asking it to get you to pick up the phone and find out more about being pain free – no obligation. So unless you are a Misery Guts get dialling!